If I was a T-shirt I'd definitely say, "I'm skinny on the inside." Because I certinaly don't feel as large as I am. It's sad, but true. I hope to be able to join the country club over near me soon, but until that happens...I thus remain as I am. I was able to complete a couple more layouts using the M2Y MOD kit. I'm not usually a very bright colored person, but I really enjoyed working with these papers. Click on each photo for a better look. I used a Basicgrey sketch for the two-pager and a Scrapbooks, Etc. sketch for the single page. Chalet Blog Challenge...my most favorite indulgence. If we're talking food, it's definitely my homemade apple pie. It doesn't get any better than that and I just can't resist it! My Mom taught me how to make pie, but she says that mine tastes better than hers. I really don't get to eat hers very often, so it's hard to say. My husband says that my pie is the best that he's ever had BAR NONE. He says he's never tasted a better crust and that I get it so perfect every single time. That makes me feel good. So, if I need to lift his spirits, or make him a little happier than normal...I whip out the granny smith apples and get busy. I had the pleasure of creating a layout using the August kit from Memories 2 You with the inspiration of a Basic Grey sketch. 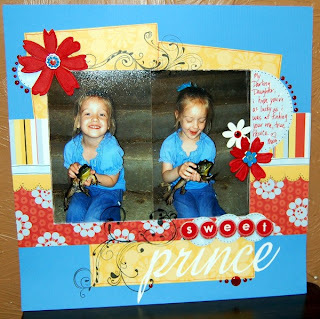 I decided to do more of the frog photos that I took of Kaila in May, because I took SO many. She's just hilarious with her love of frogs and all of those other slimy creatures. I also used my new Autumn Leaves flourish stamps. 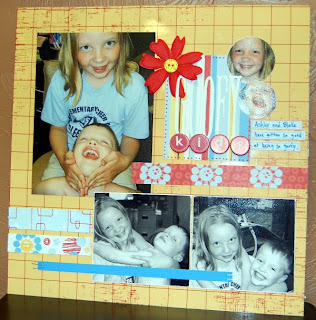 Those things are so versatile and you can create such a huge flourish with all of the little stamps. The flourish in the bottom left of the layout is three stamps. Anyway, I have to get ready to go shopping and everything else. 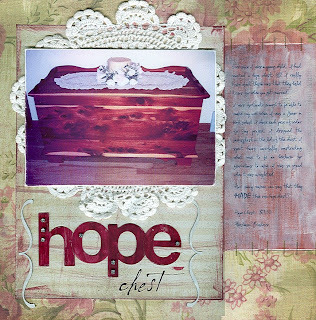 is the hope chest that I made in eleventh grade. I paid $74.50 for the wood/hinges. It's made several moves with me from Michigan to Pennsylvania (a couple different locations) until resting in its current location. I didn't really care what happened to anything else in my dwelling, but I was very involved in the relocation of this one piece. I'm not a terribly sentimental person and I could always purchase a new hope chest, but it wouldn't come with the memories of carefully choosing the wood, designing the "backsplash" or the many hours of sanding it to get it to the exact smoothness that I desired. I have a lot of great memories going to my shop class my Junior year. It was one of my most favorite classes. I loved to make things that were going to be useful. I'm not into things that aren't practical. So, when I look at this hope chest I not only see an heirloom for my daughter and her daughters...I see the many cherished memories that go with it. 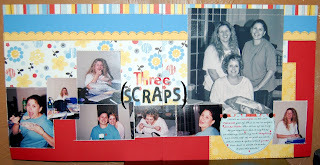 Scrapbook Chalet Blog Challenge with Jozzie! I'm not sure how many of these I'll be able to do, but it's a great idea to keep my blog hoppin'! Number 1 on the list is the one scrapbook item I cannot live without, as I'm sure no other scrapper can live without as well...a camera! I have some very exciting news in my little world. I did post it on the Chalet, but some of my bloggers don't know that I received my new Nikon D40 via DHL yesterday. I charged that baby and I took it on a test run. I took a total of 75 photos the first time out. It is so different than my other camera, which is why I already LOOOOVVVVEEEE it! I've been waiting so long for this. Can you tell I'm excited? I can't wait to see what other amazing images I get with this. The lighting was really low yesterday and I haven't read the entire manual, so I didn't touch very much except the automatic setting. I'll get into everything else later. I just wanted to PLAY! You can click on the image to see it closer, if you so desire. I guess I better get on to less enjoyable things...like cleaning. UGH!